Black Ivory Tower started as a music website, but we have always embodied a total vision on art that stretches far beyond the realm of audio. For us it is no more than logical to look at other forms of art and try to discover in them the same timeless magic that we always strive to unearth in the music we discuss on this platform (see above). 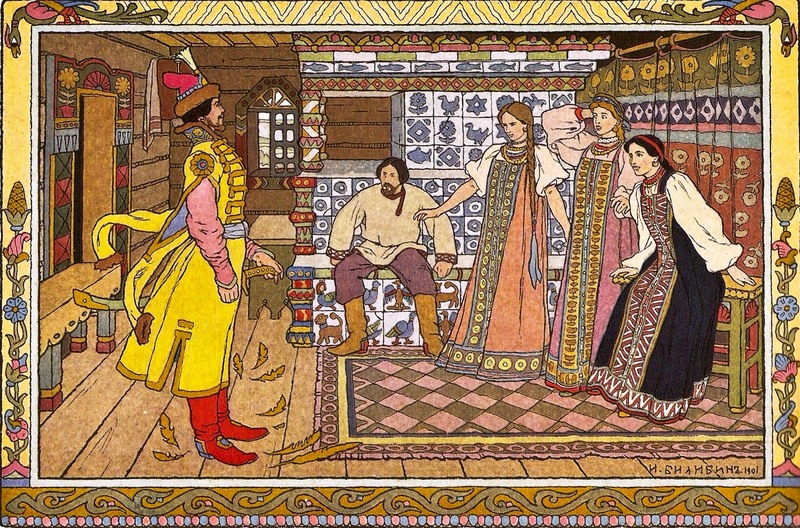 In that spirit, Kate will now take us on a journey to the fantastical world of Russian painter Ivan Bilibin. Soon you will find that his works breathe the same air of mysticism that surrounds our favourite music. – D.
Combining poignant nostalgia for the mythologized past with the technology of mass production, the international art movement known variously as Secessionstil, Jugendstil, and Art Nouveau was simply dubbed Модерн (“Modern”) in Russia. This sumptuously decorative aesthetic fused natural forms across artwork, architecture, and design, a reaction to the conservative clichés of the French-influenced art academies that dominated 19th century aesthetics in Europe. The history of this style of “new art” in Russia follows its own path, one that parallels yet is distinct from its Western European counterparts. While the Russians did have a French-style academy in the form of the Imperial Academy of Arts, that institution’s dominance had already begun to show cracks in 1863 with the foundation of the Petersburg Cooperative of Artists. This group rejected the traditional academic separation of high and low art (or “fine” and “commercial” art) and instead sought to bring depictions of Russia’s natural and cultural beauty out of the salons of the wealthy and out to viewers across the enormous nation. With the foundation of Peredvizhniki (The Association of Traveling Art Exhibits, also known as the Itinerants), these artist staged exhibitions in locales far from cosmopolitan cities like Moscow and St. Petersburg. This populist approach to art along with an embrace of Russian folk ways would have a deep influence on the next generation of students. 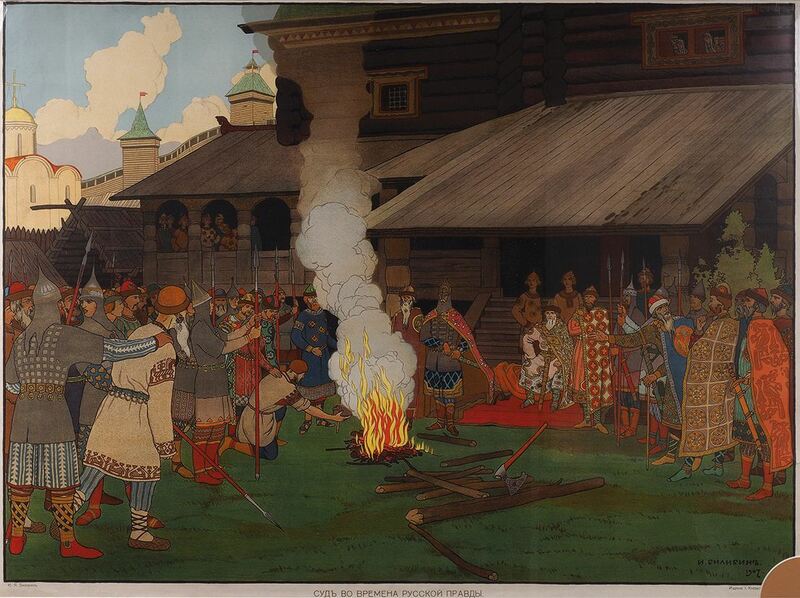 One such student was Ivan Bilibin, who would study art in Saint Petersburg under Peredvizhniki member Ilya Repin. 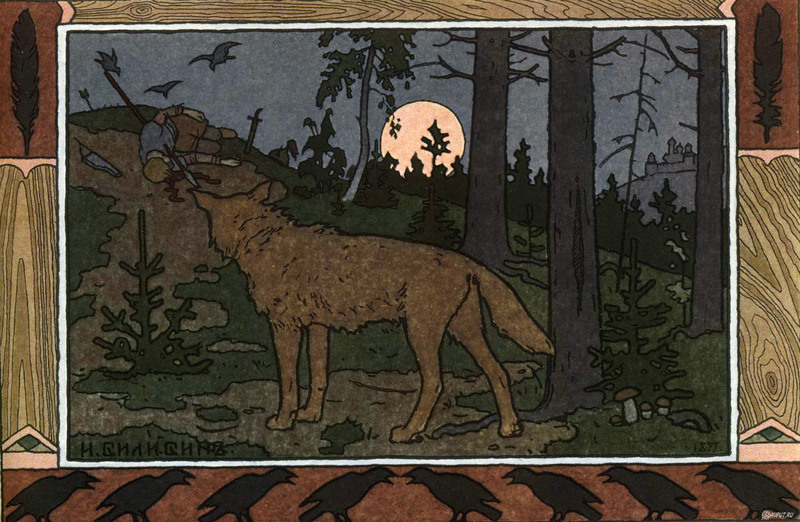 A cultured young man, Bilibin had already studied in Munich under the famed training system of Anton Ažbe, which emphasized the importance of line. Almost thirty years on, the Peredvizhniki style was beginning to show its age, and many budding artists perceived a decline in quality in the works being produced under this banner. It was time for a shift further still away from the art academies. It’s possible that Bilibin was exposed to the emerging trend of Art Nouveau through Jugend magazine during his time in Munich, or that artifacts of the emerging style made its way into his life prior to that. 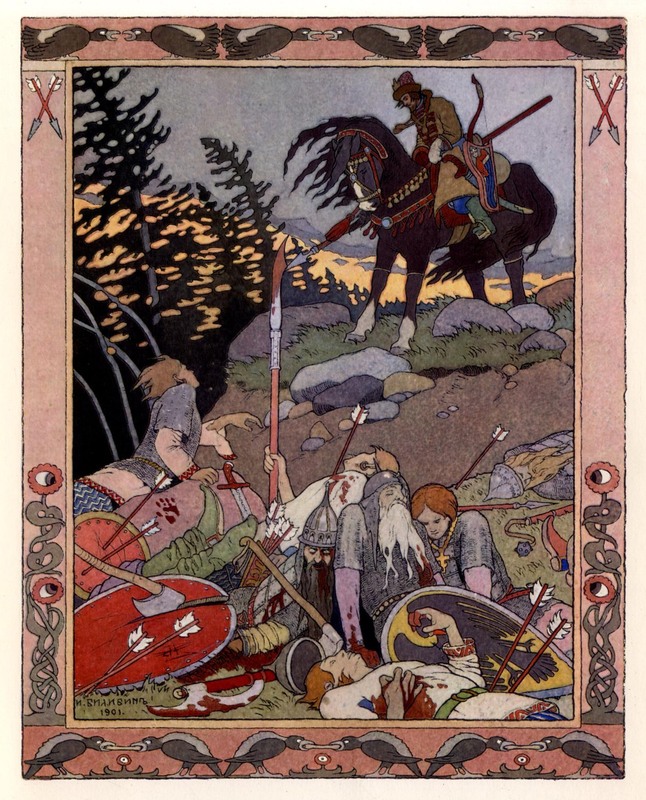 By 1899, he was among the first wave of Modern artists in Russia, creating richly detailed, line-heavy illustrations to accompany Slavic folk tales. A fantastic fusion of influences, Bilibin’s compositions combine the elaborate patterns of Russian textiles, the flat elegance of Japanese woodblock prints, and an understanding of human and animal anatomy that speaks to careful observation of the natural world. Along with his colleagues at Mir iskusstva (“World of Art”), the magazine that began publishing his art at the turn of the 20th century, he would help define a new brand of Romanticism. 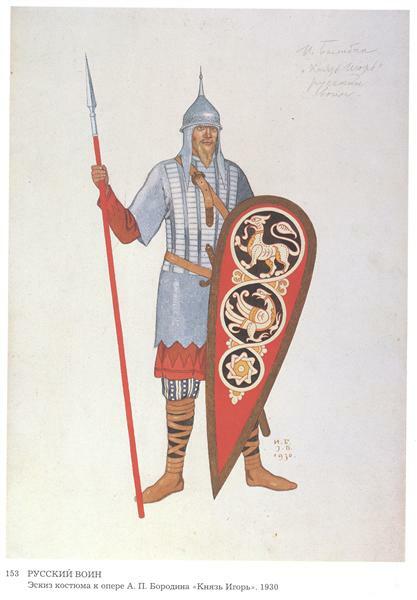 Known collectively as miriskusniki, members of this group were the key creators of work in Russia’s Modern style. No longer relegated to canvases and chiseled stone, Modern works were reproduced in magazines, books, and prints. In the same way that the traveling exhibitions of the Peredvizhniki exposed rural Russians to the joys of art and the majesty of their country, so did Modern works allow a wide range of people to delight in images that celebrated Slavic culture. 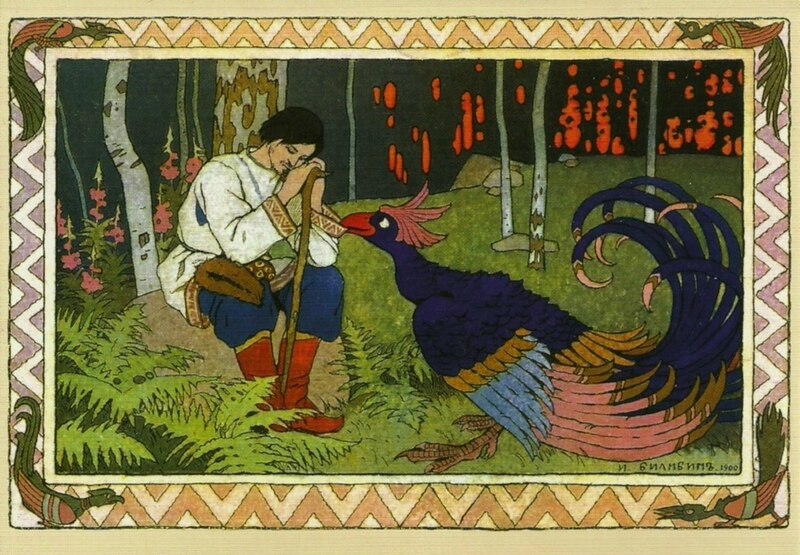 Best known for his illustrations of classic tales like Vasilisa the Beautiful and The Firebird, Bilibin’s work showed a deep affection for his culture. 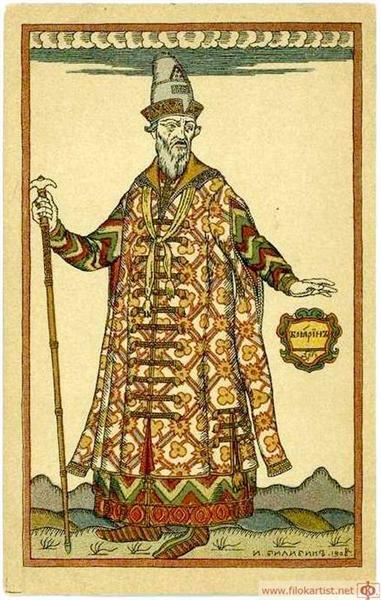 His travels throughout Russia resulted in drawings that lovingly depicted the foliage, clothing, and architecture he encountered. So adept was he at capturing Russian folk life that seven of the eight books he’d published by 1908 were financed by the Russian government. 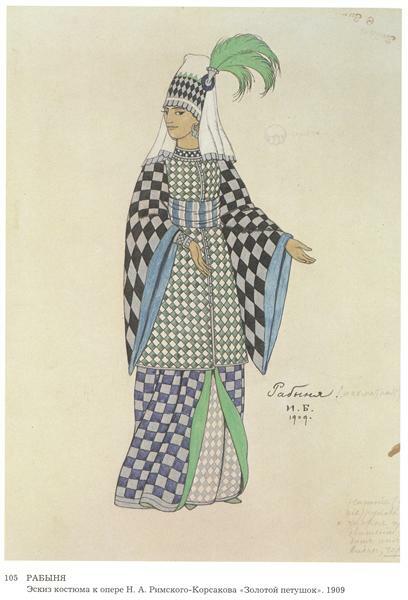 * Bilibin designed costumes and sets for operas and for the Ballets Russes, his ink and watercolor fantasies brought to stunning life on stage. His fame extended past the borders of his homeland and his art was exhibited as far abroad as England even in the early years of his career. Though he created radical cartoons during the Russian Revolution of 1905, Bilibin felt little sympathy with the 1917 revolutions and he left his homeland during that year to travel in Europe and North Africa. 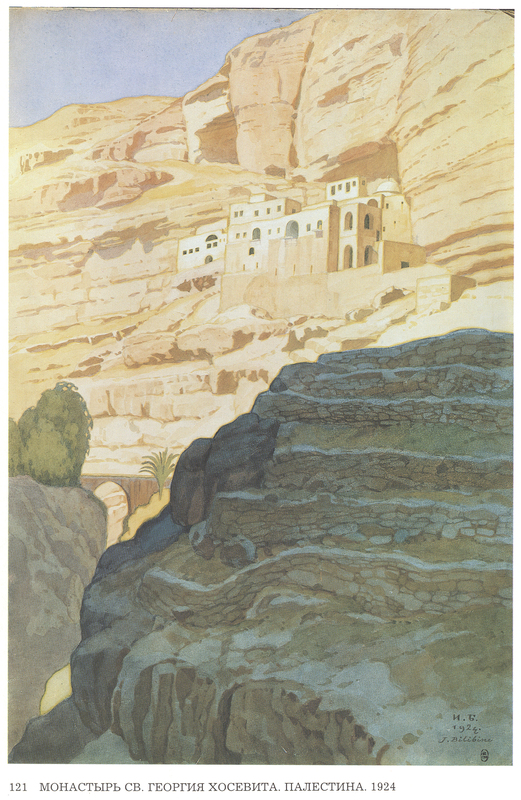 The landscapes and portraits produced during his travels reveal a sensitivity to his surroundings. Egyptian sands glowing under cloudless skies and gnarled pine trees cast dramatic shadows in the French countryside. 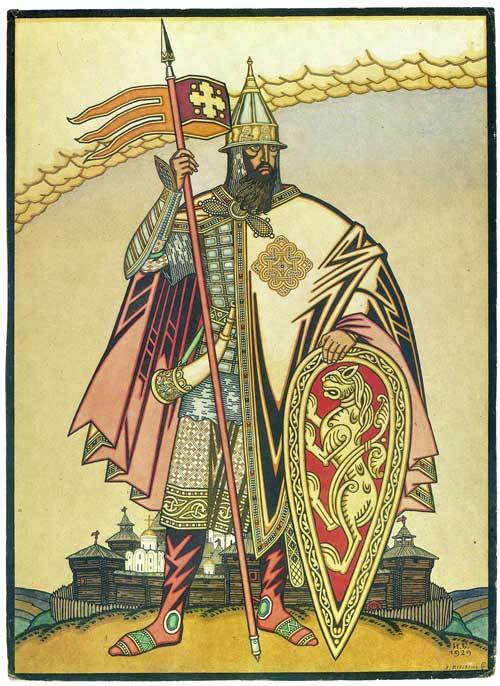 Though he lived in Paris beginning in 1925, Bilibin maintained contact with his roots, continuing to design for Russian stage productions and publications and even creating artwork for Russian Orthodox churches. His paintings and sketches for these projects would evoke medieval art in a far more literal way than many of his history-obsessed contemporaries, his figures flattening and taking on the symbolic poses characteristic of Eastern Orthodox icons. In 1936, Bilibin returned to Russia to reside in Leningrad (formerly St. Petersburg), where he would lecture for several years at the very institution rejected by the Peredvizhniki and later by the miriskusniki: the rechristened Soviet Academy of Arts. As World War II dragged on and conditions in the city became dire, Bilibin lost his life during the Siege of Leningrad in 1942. 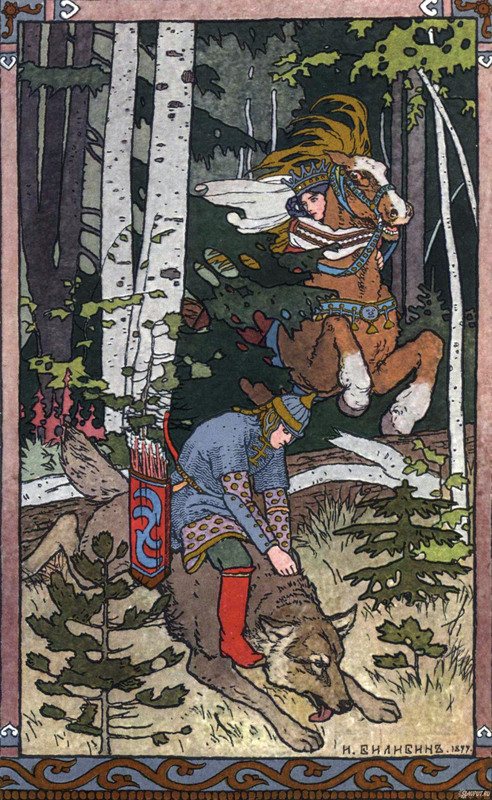 Today, Bilibin’s illustrations are among the most frequently reproduced images of Slavic fairy tales. His enchanted forests, wicked crones, and elegant maidens have found him a place of honor beside such Western luminaries as Arthur Rackham and Maxfield Parrish in what is known as the Golden Age of Illustration. 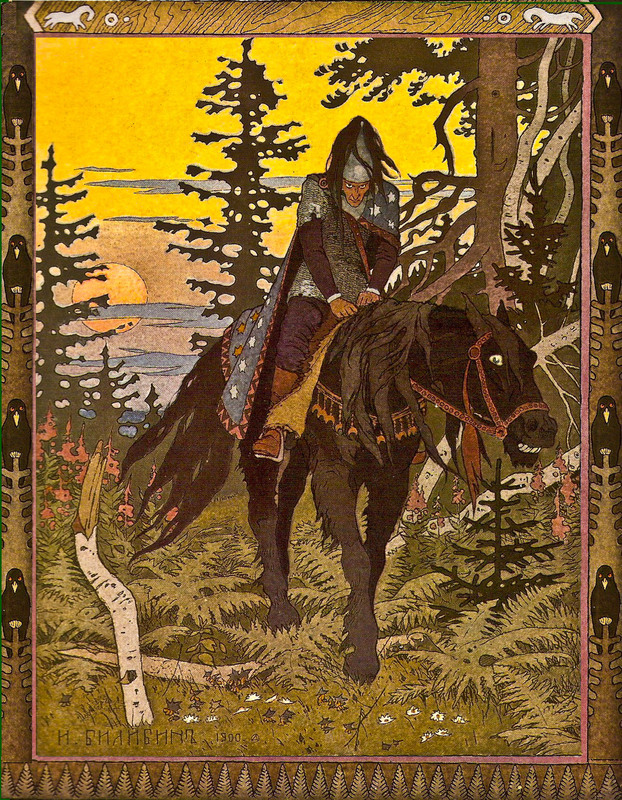 In many lists, Bilibin is the sole voice of the East represented among predominantly American and English names, a testament to the universal appeal of his artwork. Illustrator. Writer. Ascended Creep. Party Nihilist.